Like many startups, Viget started in a basement. Today, we have three sweet offices spread across the country, as well as a few long-time staff working from home. Our company headquarters is right outside DC, and we have a team of 16 in Durham, NC and a team of 15 in Boulder, CO. Keeping remote offices in sync with headquarters is tricky, but worth doing. I want to share three things we do at Viget that strengthen collaboration across our locations (plus a confession from a virtual worker). We use Basecamp and Slack for team communication. (We set up “projects” in Basecamp and “channels” in Slack by discipline, project, and location.) This means each person is part of dozens of groups communicating on different topics. Using these platforms allows for a combination of asynchronous and synchronous communication, which works well for teams working in different time zones. So, for example, when Lawson wanted to share a link to Harvard University’s social intelligence test, he posted in Slack’s General channel and, when Brian wanted to get feedback from everyone on the new dev page on Viget.com, he posted to Basecamp’s General Discussion project. Affectionately called “FLF” (Free Lunch Friday; or, in the case of Boulder, Free Brunch Friday), every Friday Viget buys lunch for the entire company as part of an all-staff meeting. All the offices join via videoconferencing and each office gets a turn to share updates. The updates loosely follow the format of the Lab Report, including office and project updates, but with some additional local flare. The updates are given with a bit of shtick and we rotate around the company for special project “deep dives” and LabShares where individuals share some work or personal interest with the company. These meetings are scheduled for an hour and 15 minutes, though sometimes run longer. A quick side note: ordering food for groups can be a logistical nightmare, so we built Shorter Order that makes it easy to get a group order off your to-do list. Since the beginning of Viget, it’s been a tradition to get together in person, out of the office, to reflect and celebrate the past year. The gatherings have evolved over the years and now play a vital role in connecting the remote offices. These events typically include a half-day or so of discussion and then an evening and following day of social activity. One of my favorite recent ones was at a campground where our meeting was held in a lodge by a lake, and the evening included bonfires and music late into the night. The next morning, we learned about forest medicine, archery, and other survival techniques. In addition to the elaborate annual celebrations, we also get the whole company together one additional time per year (for more work, less play) and encourage modest inter-office travel whenever people are up for it (for the in-person collaboration benefits). Working with remote teams presents a lot of challenges, some of which we still struggle with. For example, we’re getting better at making videoconferencing a habit; but, the technology is not completely reliable (see below for notes on videoconferencing). I’ve seen a lot of our meetings start late because the connection or configuration isn’t quite right. Incorporating chat into our workflow using Slack can be great for collaboration; but, it’s addictive and can also cause a lot of distraction. Will remote work ever be perfect? Probably not. But, given the trends (which clearly show remote working is on the rise), we don’t have a choice: we have to tackle these challenges. The good news is that being conscientious of distributed teammates gives us empathy for our clients (who are usually remote). As remote collaborators, we learn to proactively provide status updates, share progress, and acknowledge each other's messages and feedback. These kinds of habits make us better communicators across the board. There’s a plethora of videoconferencing tools out there; but, we have yet to find a reliable solution. We predominantly use Google Hangouts and Go To Meeting for group conferencing, which have performed better than other tools we've tried -- but, they are still fickle. Since we’re all on Macs, FaceTime works well when you only need to talk to one person. talky is getting daily use from our dev teams and join.me is also a favorite -- similar to Go To Meeting, but you don't need to download and install a desktop application to view screencasts. 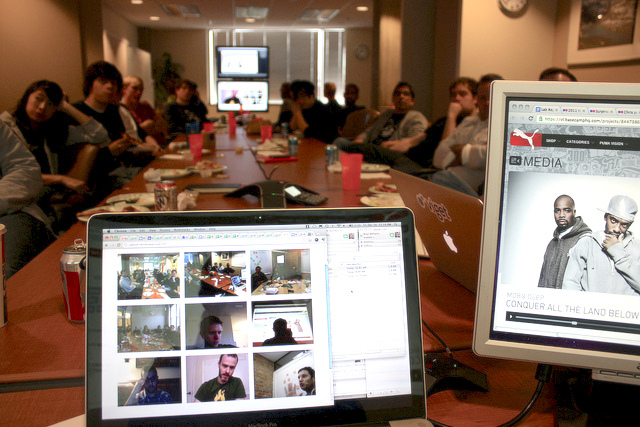 And, when we’re videochatting about code, we use Screenhero.